There is a lot to do, so even you can help to make the Hanfarade into an awesome demo. Do you want Paul McCartney to play and speak at the Hanfparade? Then organise a bus with his fans to drive in front of his house door and bring him directly to the stage at the Hanfparade. Do you have free time to get active? Distribute posters and flyers or help us directly by joining our team. Perhaps you could even participate with your own parade truck ..? You want to create your own parade truck? We have compiled information about how much money you have to plan for and what needs should be considered for the construction. Also, which security and safety rules must be observed and where you can find the best deals for hiring the vehicle. Even in Berlin, amongst other locations, the Hanfparade needs advertising! In order to let as many people as possible know when and where the Hanfparade is taking place, flyers need to be distributed and posters posted. Advertise for the Hanfparade in your area, inform yourself under “Distribute Posters and flyers”! Even if the Hanfparade is far away – Berlin is always worth the trip! You do not have that much time, but instead some excess money waiting to be spend for a good cause? 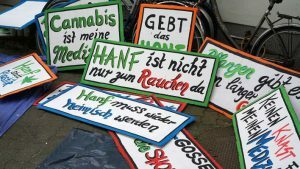 So, you want to support the activities around the Hanfparade – is it possible? Yes it is, you can also donate money, this is extremely important! You have a website, are running a blog or forum? The Internet helps us to express our opinion and to disseminate it. Help make the Hanfparade be a recognised event by using your website, place a link on your site. Here you can find banners in many sizes. You have interests in political and hemp related activities and action? Then we will warmly receive your contact – here’s the info page to do so. The work of the organisation team begins long before the first demo visitors arrive at the starting point. Help us forge and organise the plans for the Hanfparade. Join the organisation team!